Shelley TSivia Rabinovitch is a cultural anthropologist with a Ph.D in religious studies from the University of Ottawa. She started to write academic papers on comic books and other 'offbeat' topics during her B.A. days and has seen no reason to stop since then. Shelley is one of the co-founders of the Ottawa Science Fiction Society, a filker from way back, and holds numerous convention awards for costuming (back before the term "cosplay" was even coined). She isn't otaku, but is fascinated with the differences between Anime and western forms of animation. Shelley teaches at both the University of Ottawa and Carleton University, focussing on the intersection(s) of women's studies, ritual studies, religion, and cultural studies. She was the 2006 Part Time Professor of the Year at UOttawa, and her class "Magic, Witchcraft, and Occult Phenomenon" has been the most popular course there for many years. She has published two books as well as numerous book chapters on paganism and Wicca in both the academic and popular press. 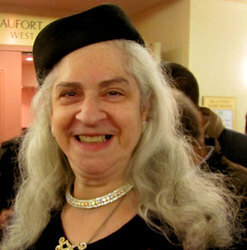 When not busy with academe, she is also known as "Baroness TSivia bas Tamara v'Amberview" in the Society for Creative Anachronism, her main hobby for over 40 years.